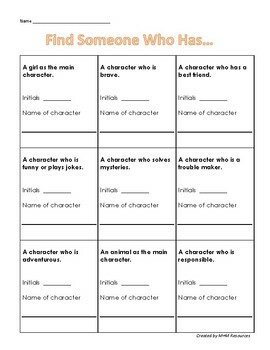 "Find Someone Who.." for Character Unit - fun activity using character traits! Get your students up and moving with this cooperative learning structure (based on Kagan structures). Great class-building activity during your Character study for early elementary students. Kids will each get this half-sheet, walk around and find out about their classmates' characters that they're reading. Students will practice thinking about character traits during this activity. Have fun!